Yes it's that time again for a brand new bontegame! Get behind your cursor keys and enjoy my latest creation titled 'Farafalla'. Spread the word and please share the gamelink! Cheers! Nice checking it out now! Vond hem maar matig bart ..
Bart, this is your best game EVER! Love love love it! So cute and love the end a lot! Cute game, very nice Bart - thank you! Made us work extra hard for that white balloon haha. It was adorable, and I loved the idea of making it a metaphor for falling love. I think it needed a little more challenge though - the platforming was very simple so it got a bit tiresome towards the end. Cute and simple! All I could think while going down was "oh... I have to go back up these 40 stairs, don't I?" One of your easiest games. It took me less then 8 mutinies. Please stretch on the Factory Balls series, I'm a master at those. Neat little platform game, though I think I want pasta for dinner now...but love is better than pasta. You can do better, Bart... I know! I like it. But agree that it could be harder. This game is so deep! Love the methapor of falling in love and all that comes with it. hello from Greece ! !ok cute game but i love the sugar games ....what about a new one sugar game ??? Nice platformer... I expected the final to be something completely different! But... not one of your best games, Bart... In my opinion only, of course! Nice designing. But the game in general was pretty pointless. Kind of felt like a social experiment for what people are willing to do. By the way... I've got a question for you (and I'm sure I'm not alone): what "Farafalla" stands for? Nice & sweet, easy but oh so cute! I just love the methaphor. Something different for a change. Well done, Bart! I would prefer that the look of the game was a bit more like your other games, and not so pixelated, but that just me. Anxiously awaiting your next game! I enjoyed this one very much, Bart. It was little short (for me) compared to your other games but I loved the classic platforming elements. Thanks for giving us this new game! Such a lovely game Bart, thanks! Well, I am somewhat disappointed. Most of the time there was no type of music, and it was a little too easy to beat. I liked the music at the end, though. So cute as always, lovely! So cute. Fun to play. Thanks, Bart! I LOVE IT!!!!! You're wonderful Bart! Just got the pink balloon, and I'm already hooked. Any game that lets me have 2 balloons at once is good by my standards! very, very nice. Thanks bonte! The music was in issue for me. I had it during the opening "falling" scene and then it shut off. I just had the jump noise and it really got on my nerves, so I shut off the sound on my PC. Was there supposed to be music through the whole thing? Nice and cute game! Ideal for playing during a short break! I like this. I love that all your games have a sweetness to them. Reminded me a bit of "Continuity" too which is one of the best flash games ever made. Keep up the good work, Bart. You've got a fan in me. Absolutely gorgeous, Bart. I love pixel games. Annoying game. The little freak should move faster. Really? Another (bad) clone of Knytt? I'm dissapointed. awwww very cute. nice game- a little bit of a puzzler- but not too hard. :) nice colors too. The only thing I know...I'm falling, falling....asleep. That was so far below your normal high standards I don't know where to begin. Yes a cute character but trial and error gameplay, combined with long empty corridors and a slow moving character do not make for an enjoyable experience. Sorry Bart but this was not a good one unless is was designed for the under tens. I know *some* might think this is too easy, but I enjoyed it immensely. It also is a fun, easy game for my kids! Thanks again, Bart! It was really cute, but I wished there were at least controls for running, or something... Also, like a couple other people said, I think a less trial-and-error type of gameplay would have been better. Or at least maybe funny or interesting little signs along the way, if only to give us trivia on the... total landmass of Asia. Or something. I don't know. To be honest I was very disappointed in this game. I was excited when I saw this was a game that Bart made, but this one had no challenge to it at all. I love most of your other games though Bart. Good game cute message, but the walking speed needs to be increased because of the short nature of the game. Bonte is a legend! Gotta love this game! I really enjoyed the game, I love mazes although i expected having to find my way back out to get through the colourful bars at the top, that would have been really hard. I usually don't like platformers, but this one I did - exactly for the fact which others here critisized, like that there is no running mode. keep it simple! Ta. Nice and simple. Ta again. I love this game. It's so cute!!!! The game reminds me a bit of the "robot wants kitty" series, but without the fun. Don't worry Bart, I see this as a test - you wanted to see if you could get the mechanics of a platform exploration game down, and you did that well - it played very smoothly. You got the basics down pat, now be your brilliant self and amaze us! I don't understand the criticism. Such a lovely game Bart! Keep your awesome games coming! Total playing time ~7 mins. I know the price is right, but I would like a little more entertainment for my money. Perhaps I missed something important? Boring as heck, BUT, did anyone notice, the grass under your feet? boring, and no rewarding end. loved it! lovely little time waster. make another adventure for this lovely couple! thanks bart! Simply not good enough, Bart. Simply not good enough. What a lovely game, with such a rewarding ending, keep your games coming Bart! I liked it, Bart. Short and sweet. @ David - what grass? Didn't notice any grass. By the way - did anybody try to go back upstairs with all those balloons? I wonder if anything happens there? here "anonymous 2nd, 3rd and 6th post"
BTW I find the negative posts a little too much. Ofcourse we have all high expectations and this game does miss something. But it's not a bad developed or very frustating game. I went back upstairs with all balloons but nothing happend, I could not pass the pipes. @Carly, I went back with all balloons and could walk through the colored lines! Nothing else happends, I had to go back down to finish the game. Well Bart it isn't ur best game or most complicated but it wasn't bad at all. could use music. Agreed that it could be the basis of another game. I enjoyed it, but seemed rather short. Calls for a sequel. No real plot line, when he met the girl, I execpted more levels. Too simple. I'm glad he finally came out with a platformer, but this is not an outstanding one, but still decent. One of those games I would only play once. Seriously, A SEQUEL IS ALMOST MANDITORY with this plotline. Graphics are a little wacky. honestly, i didnt like it. and because of that i wish to remain anonymous. sorry man, i would like to be encouraging about this stuff rather than critical. just a few suggestions to make this game funner if you choose to make a sequal is maybe have a revealable mini map, some nice power ups, and maybe some upgradeable aspects to the character, a quest system to get further into the game, maybe put a little more story into the mix, i didnt like this game but i do think it has alot of potential to be a great game with a little more work. I don't know if Bart intended it to be this way, but, for me the relative ease and simplicity of the game combined with frustration (having to jump all the way back up several stairs - often having gone down to find a dead end)was all a good metaphor for love - not just the obvious falling aspect. Games don't have to be long, complex and fast paced to be beautiful and thought provoking. But, never mind, each to their own, this is simply my opinion. Aw, bummer that nothing happened when going back. Bart, you are awfully quiet - what are you thinking? Are you disappointed that so many people didn't like it? Will you make a sequel? A penny for your thoughts! Easy enough for even my 5 year old to understand and play, but we quickly got bored after the 4th balloon. A good start for a more challenging platform game, nice idea. Not your best game, but at least, not as boring as sugar. Ooo yeah, not first but 100th! Awesome. Such a cute, fun game that gave me a short break from my day. It made me smile. Thank you Bart. Very boring and uninspired game. No fun at all, i'm sorry. very cute but oh so short! WHAT I DO LIKE IS THE STYLE OF THE GAME. OK, needs enemies or power-ups, or something. It was just a big maze. BORING! Come on, Bart, I'm a kid from the USA. I NEED EXCITEMENT! LOVE games like Mario or Legend of Zelda, make a game like that! That was fun, thanks for making it, Bart! I love this game. It felt purposely vintage, loved the bright colors and how the green contrasted great with the blue background. It was simple but enough of a hook to make you wonder what was behind the next door, and at the end. This one was fun, no need to have to consult a walkthrough or peek at comments to figure it out. 5 out of 5 stars, thanks Bart! Thanks for massively playing my new game!! 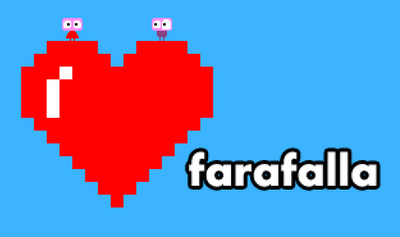 I wanted to make a platformer with 'Farafalla', but I didn't want it to be a traditional one. And yes, if you want, you can discover a lot of symbolism in the game. High annoyance. Low reward. Nothing but a key maze. Many things put in just to make it more annoying, without actually raising the difficulty level. No real puzzles to solve. I was seriously expecting better. Thank goodness the colors were bright and weren't so close in shade so us colorblind people could enjoy it, unlike those escape games where the colors are almost identical which makes solving it impossible. ...But not really up to your standards Mr. Bonte. I really expected better, I always loved your unique style, and thought you were above pixel platforming. Your games are usually so memorable and fun, but, (I'm sorry sorry sorry!!!) Your platform game here really doesn't satisfy. I love platform games, and this was a disappointing Bonte game and platformer. I'm all for trying new things (and the metaphor for falling in love was neat) but you should really stick to what you're good at. Your artistic styles in other games are really neat, and you could have made it interesting like them while still applying your ideas. Again, I have nothing against this game, but I know you can do better! I'm reading things about money, and they say that it was a wast of their money, but YOU DON'T HAVE TO PAY MONEY. YOU CAN GET IT FOR FREE! Really nice, short, pointless game! Just how all great games are! Nice little game. Easy, but fun. I was disappointed with all the hype with the youtube video, the dramatic pause leading up to the release, then the release. Seemed a bit lacking. The one thing that I agree with anon 17:36 on is the colors were spot on for a colorblind person as myself and themself. I'll show some love to the game for that. it was a pretty good game. i thought it was a little less than what you usaually make and i didnt like that it anded after the girl is found. it was fun nonetheless and i enjoyed it. please make a sequal to farafalla!!!!!!!!! To be honest, I didn't like this game. It was very repetitive and didn't have any challenge to it. The level led you to each balloon, then you picked up the balloon, then you walked back to the door. Rinse and repeat. I only stuck with it because I kept waiting for something interesting to happen. But let's be fair, Bart -- I know this is your first platformer! So I hope that you take my critiques as complimentary, and bear them in mind when you make a second one! I have faith in you. BONTE ESCAPE! MORE BONTE ESCAPE! Bart!! I love your escape games- they are amazing! This game was cute, but a bit disappointing. I keep on hoping for another escape game, or something like a bark in the dark where you go outside :) Your games are the best, especially the escape rooms. I played this game 30 times, but I still love it!!!! I was hoping I'd be able to look back at the end and see where I'd been and whether I'd missed anything, but it is cute. It's nice to have a platformer with no impossible jumps: I usually don't click on random platformers because too often I get a couple of levels in and then it requires pixel-perfect jumping, co-ordination I can't manage or key-mashing faster than I can keep up with. Some of the ones here were tricky, but not too tricky. Also, it's nice to have a game with no instructions that genuinely doesn't need them. Can't believe I misses this. I have been following you for awhile. Great colorful game! I have "fallen" in love with this game (pun intended)! I love this game!!! It is the best!!! !